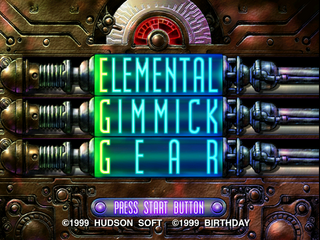 Elemental Gimmick Gear, called Elemental Gimmick Gear: E.G.G. (エレメンタル ギミック ギア) in Japan, is a 1999 action RPG for the Sega Dreamcast by Hudson and Birthday. Concept Game Design: Birthday Co.,Ltd. Main article: Elemental Gimmick Gear/Magazine articles.